The irony of a water gun fight is that you basically have to put yourself in the range of your adversary's weapons and retaliation in order to accurately hit them. But not any longer. 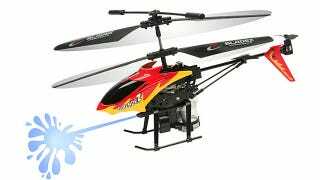 Indoor RC helicopters have evolved in leaps and bounds over the past few years, and now they come with built in reservoirs and water cannons. Okay, 'cannon' might be a bit of a stretch, but this RC toy can deliver an H2O payload that will certainly annoy your target, even if it doesn't soak them. Its infra-red remote works from up to 30 feet away, keeping you at a moderately safe distance to escape retaliation. On a single hour charge you're probably looking at about five minutes of flight time given the extra payload, which isn't a bad way to terrorize your co-workers for $40.